Three weeks ago, I started on a project with three other Providence entrepreneurs. Our goal is to raise $10,000 dollars through the crowd funding site RocketHub, and create an awesome smart power strip: Cactus. It came together very fast, and it had to. We didn’t start planning this campaign until a week before the launch — which is not a good recipe for huge success. Read any crowd funding advice blogs and they are all about planning and having a strong launch. While our team is awesome and our product is super useful, our campaign planning has been very rushed. Still, I believe this project will be successful in the end, allow me to tell you why. 1. These Venture for America fellows (my teammates) are amazing. Everyone else on my team is a Venture for America fellow, people that are plucked from college and trained to work in the start up world. These particular fellers have the perfect mix of experiences to make a brilliant product. Jon is awesome at designing. He designs furniture and works at Ximedica. He made the sleekly designed mock-ups of cactus (above). Ethan is our hardware expert. He works an energy tech company, and has a lot of experience designing this kind of stuff. Giuseppe is an internet marketing guru. He co-founded a company that specializes in social media PR campaigns. And business is booming for them. Plus me, a self taught iOS and front-end developer. Sadly, I might be the weakest link, because I’ll have some learning to do about micro-controller programming (luckily I helped make this recently) and secure wireless networks. 2. I love this product. 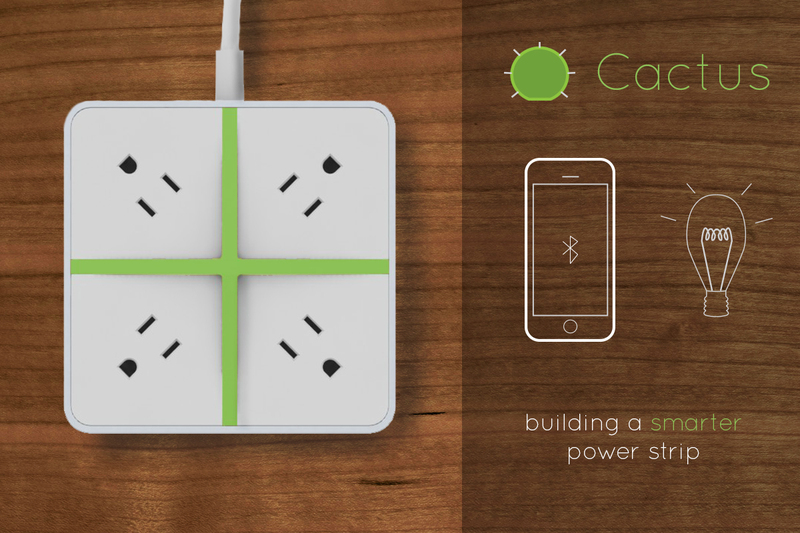 It’s not the first wifi-controlled power strip to be dreamt up and created. But it will be the easiest, most convenient, and is currently the cheapest (you can get one on our RocketHub for $40 still). The dream is that we can expand from this and offer even more products that make cutting energy waste easy. Devices that will remind you if you leave something on while you’re away, and let you turn it off. Lights that turn on when you get home. If you’re out of town for a while, have lights turn on in your house to make it look like people are home. There are many applications for this device. 3. There’s 5 days left! There’s nothing like a crazy deadline to bring out the hustle in us all. We’re at 22% of our goal right now, so help me spread the word.